For those who believe that life should be simple, delicious, & nutritious. Growing up I always hated bananas. The smell, the mushy (lack-of) texture, the fact that people liked them when they appeared to be brown and rotting on the counter…..uhhh gross! However, like many other foods, they turned out to be not so bad as I grew older. Similarly to adding foods into my diet, over the past few months, I’ve cut certain foods out. Not because I don’t like them- but because I am a firm believer that what (and when!) you eat directly affects everything from your sleep patterns to your energy levels to your complexion and to your overall well-being. I’ve been studying this you- are- what- you- eat concept, and it has been absolutely enlightening, in my opinion. So- what have I cut out of my diet? Today we will talk about the main one…Dairy. (Gasp!) I knowww. I know! The girl who loves to claim her Italian heritage doesn’t eat cheese anymore? Yeah, I won’t lie, it was rough at first. I once thought that cheese alone was a 4-6 servings a day food group. I’m not lactose intolerant, but I’ve read many books on the benefits of going dairy free. I thought, why not try it out? The results: I immediately lost weight. (Woohoo!) Well when you are eating basically a giant tub of greek yogurt in three days time (okay 2.5 days) and feta cheese on everything and anything, weight loss is bound to happen. Still exciting though. I also immediately saw a change for the better in my skin. It is clearer than ever! (Woohoo!) I can’t say that I stick to it 100%….I’ve definitely slipped up a few times in the past three months that I’ve been “dairy free”- which is okay- but I’ve realized that I feel so much better when I’m on track with it. This post has no intention to sway you to try a dairy free lifestyle; it is more to inform you that you should take into consideration the way the things that you eat affect you overall, not just your waistline. It’s incredible when you find that a simple diet change can work greatly in your favor. Branch out a little bit, try something new. Here, for example, is a recipe for a food that typically involves a heavy handful or so of cheese. I’ve re-made it absolutely delicious without any dairy involved. I pre-apologize for the lack of ingredient measurement, you know I hate that stuff. 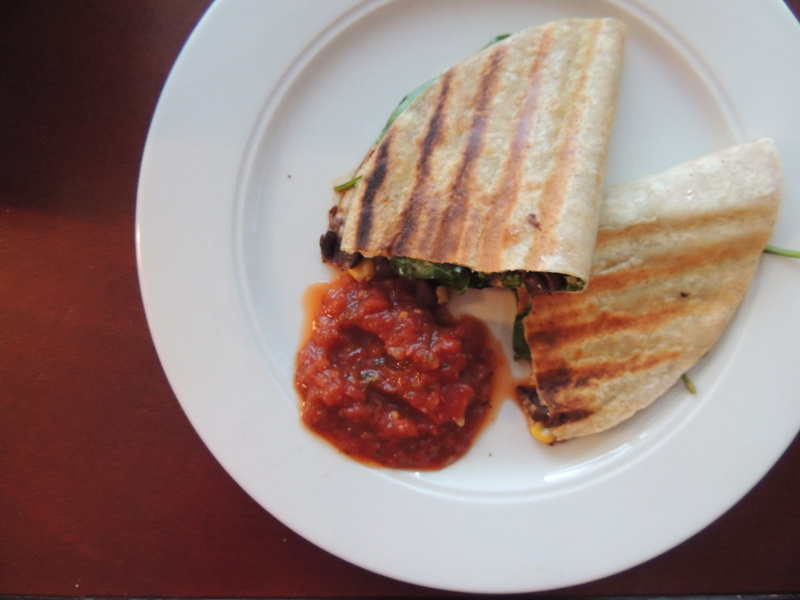 Black Bean and Corn Salsa Quesadilla – makes 2. 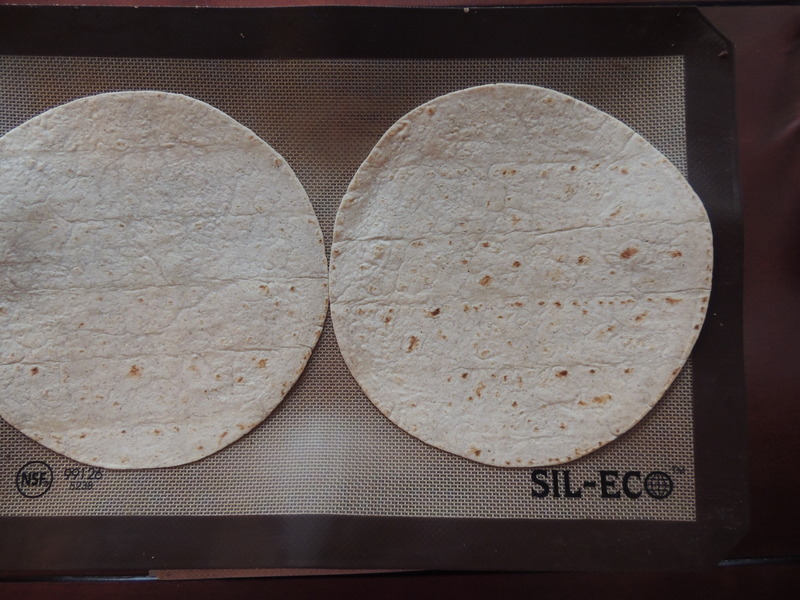 Place two tortillas on a flat surface or baking sheet. Spread about one tablespoon of hummus on each tortilla in a thin layer. Add a handful of spinach on top of each tortilla. Next, drain and rinse a can of black beans. Add approximately 2.5 tablespoons of black beans to each tortilla, followed by the Corn Chile Salsa. It’s sweet and spicy- definitely a great find that my mom discovered (Hi mom!) and would send to my brother frequently because he loved it too. I like a lot of it- you might like a little. Do as you wish! Now would be the time to add some cheese or grilled chicken if you simply cannot imagine a quesadilla without it. I would recommend some grated sharp cheddar! Fold each tortilla in half and grill the quesadillas until crispy on your George Foreman grill. (I’m pretending that you all have one of these, if you don’t- I suggest you get one already.) Or maybe you have one of those quesadilla makers! You could also use a grill pan- be sure to carefully flip so you don’t lose all your ingredients! 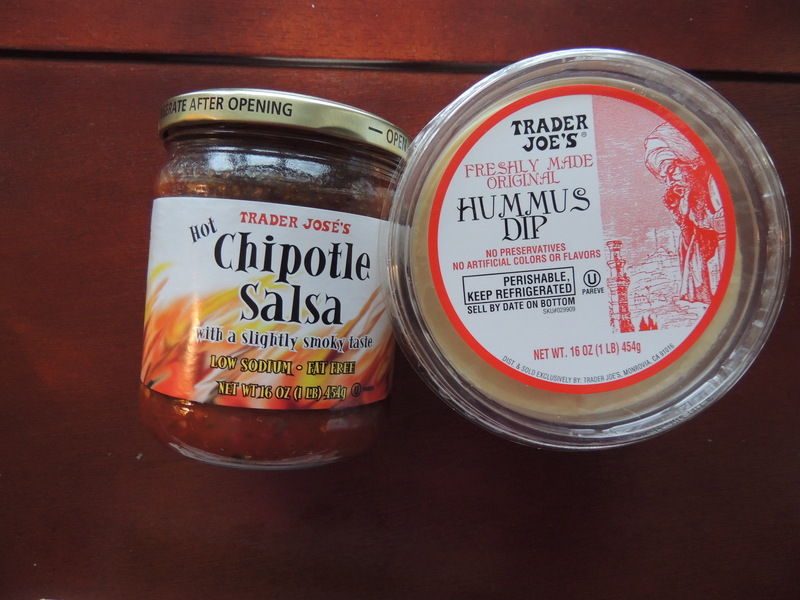 Enjoy with some spicy salsa or extra hummus. You’ll love it. I swear. Have you given up any food groups? How did it affect you? I’d love to know your thoughts! Why do we color eggs for Easter? Like Eggs, Flour, & Oil!